It would be difficult to argue against 101 Dalmatians (1961) being one of Disney's finest animated films. Walt Disney himself sought out the rights for Dodie Smith's children's book of the same name, and the resulting film is one of the most beloved and enduring films in the Disney canon. It's certainly a charmer; the dogs are some of Disney's most delightful heroes. But the real star here is Cruella De Vil, one of the mouse house's most wickedly clever creations - a chain smoking, fur obsessed one percenter (before such terms had been coined) who was willing to do anything to turn a pack of dalmatian puppies into a fur coat. Such a dastardly villain (she wants to kill and skin puppies!) certainly cemented the film's place in the Disney canon, but the truly ghastly nature of who and what Cruella is helped ground the film in its more realistic modern setting. That immediacy made Cruella all the more terrifying. She doesn't have supernatural powers, she's just pure evil. Cruella's evil may be what seared the film into the minds of so many (with the help of George Brun's immortal song), but visually it's one of the most striking Disney films of the classic era, with its almost impressionistic pencil drawings and dazzling use of color. 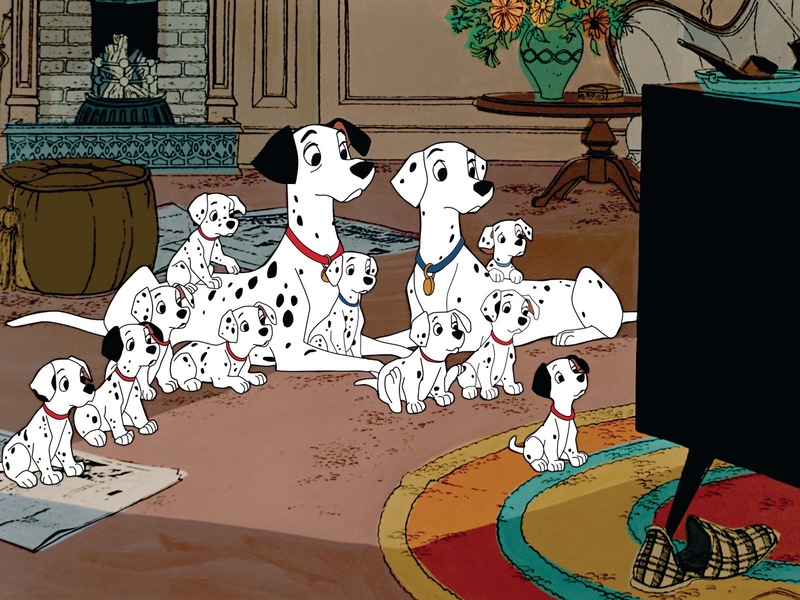 101 Dalmatians was the first Disney film to utilize xerography in its animation, meaning the individual frames no longer had to be hand traced onto separate cells, leaving behind the stray lines left by animators' pencils. This gives the film a unique look, one that would endure in Disney animation until computers replaced the xeroxing process with 1989's The Little Mermaid. All of this is fascinatingly detailed in the special features on the new Diamond Edition Blu-Ray, which thankfully includes all the features from the Platinum Edition DVD, as well as some mostly minor new extras. It seems as if Disney learned their lesson after the underwhelming Diamond Edition of Sleeping Beauty failed to include any of the old special features from previous editions, and replaced them with some rather lame kid oriented bonus content. While many of the old special features provide history lessons for grown ups, the highlight of the new content is "The Further Adventures of Thunderbolt," which follows the heroic western canine that so enthralled the puppies on TV in the film. While it's unfortunately short lived, it's fun to see more of Thunderbolt. A feature hosted by Disney Channel star Cameron Boyce is mostly perfunctory, but a 1961 featurette called "The Best Doggone Dog in the World" hosted by Walt Disney himself makes for an entertaining time capsule. 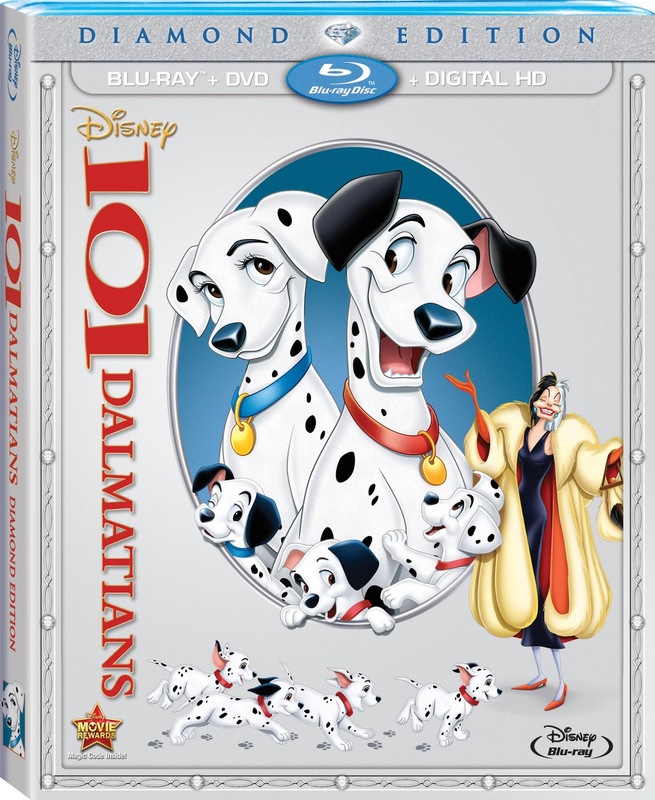 It provides some insight into what made 101 Dalmatians so special for him. And clearly this was a labor of love, you can feel it in every aspect of the production. While it was remade into a live action version in 1996 starring Glenn Close (a film that, for all its Home Alone style antics, was surprisingly good), nothing can ever beat the original. As always, these Blu-Rays are limited editions, and will be heading back into the infamous Disney vault before you know it, and this is definitely one that belongs in any true Disney fan's collection.